Like most music fans of another generation, back in the day I made hundreds of mixed tape cassettes for friends, girlfriends, and personal listening. For about a four year period (’86-’90), literally every single one of those cassettes included the Tommy Keene song “In Our Lives”. While not Keene’s most well-known song, this gem of pure power-pop brilliance combined the perfect balance of sweet melody, chiming guitars and hooks to spare. Like a musical sugar addiction, I couldn’t get enough of this song or the album on which it appeared, 1986’s Songs From The Film. I still have the well-worn vinyl. It was Keene’s major label debut, and while the Geffen record may have been more produced and polished than the break-out Places That Are Gone EP, it nevertheless was a full long-player of Keene’s irresistible guitar-driven pop songcraft. 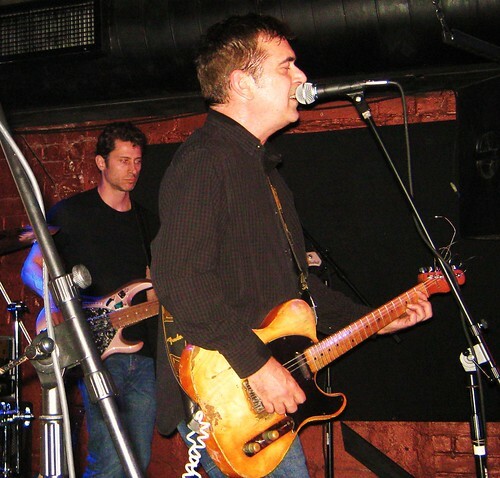 Tommy Keene is currently on tour playing the complete Film album, and on Wednesday that tour reached The Rock Shop. The set warmed up with two more recent numbers and then jumped right into the album. What was obvious from the chill-inspiring open riff of “Places” was that Tommy has aged extremely well. As the band ripped through each track — there isn’t a clunker on the entire record — it was also clear that the songs had aged well too. This album would be as relevant and inspired if it were released today. This set was recorded in the same manner as my previous trips to Rock Shop and the sound quality is superb. Enjoy! If you download this recording from NYCTaper, we expect that you will PLEASE SUPPORT Tommy Keene, visit his website, and purchase his official releases directly from Merch Store at his website [HERE]. Thanks Dan…sounds great as always! Just saw the last night of the tour in San Francisco last night . AMAZING!!! Tommy rocked like nobody’s business and the band just cranked. Loud but loud in a way that made you happy and the songs from “Songs from the file” just sounded great. We all know about the production on the record, Tommy played the hell out of those songs and it just made me think about how his songs have been a part of my life for many years and still are. Wow! Thank you so much for this nostalgic nugget. I made a few mixed tapes back in the day, it was a rare thing when I made one that didn’t have Tommy Keene on it.